Evidence from tree rings and other temperature proxies suggests that during the previous 500 years global temperatures were 1.0ºC cooler than those of the 20th century during a period roughly from 1300 to 1870 – known as the Little Ice Age. While overall temperatures during the Little Ice Age were cooler than now, there was much year-to-year variability and some warm periods. The coldest part of the Little Ice Age, from 1645 to 1715, was also a time of minimum sun spots, referred to as the Maunder minimum. 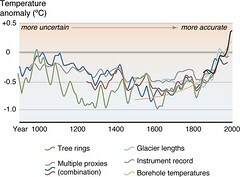 Although there is a correspondence in time, the causal connection between sun variability and Earth climate is a subject of ongoing debate. It is clear, however, that the 20th century was recovering from the average colder temperatures of the 19th century and earlier.